Alanya is part of the Tentative list of Turkey in order to qualify for inclusion in the World Heritage List. Alanya is relatively small Turkish mediterraean resort some 100 km from too much popular Antalya. I spent there my fall holydays in 2012. Weather and water-temperature were already bearable for my Central-European body in October. I must say I enjoyed my stay there. As the political situation has slightly changed in Turkey, I am afraid I am not going to travel there in near future. 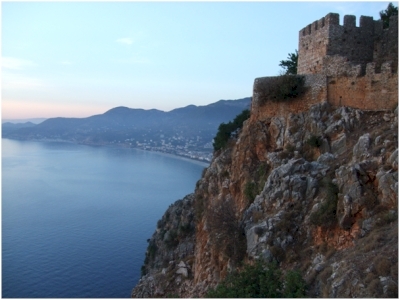 The old parts of Alanya is located on the slopes of huge rock. One can walk there from the port, where the massive octogonal tower is located. There are small unmarked trails going through the area of slowly collapsing houses. The most interesting part is the huge fortress with massive walls on the top of the rock with stunning views (photo). Though quite nice place, I cannot see any OUV there, and ancient fortresses are already represented as WHS.